Leprechaun Luck Video Slot Review - Casino Answers! Leprechaun Luck is a 5-reel, 31-line video slot developed by Slotland, featuring a wild symbol, a wild multiplier symbol, scatter wins, a bonus game and a progressive jackpot. You can play the Leprechaun Luck video slot at Win A Day Casino. Bets on the Leprechaun Luck slot machine are $0.01, $0.02, $0.05, $0.10, $0.25, $0.50, $1, $2, $3 and $4 per line. You can select up to 31 paylines. You can bet anywhere from a penny per spin up to the maximum total bet of $124 on the Leprechaun Luck penny slot. The Leprechaun Luck video slot has a good betting range that is ideal for most online slots players. 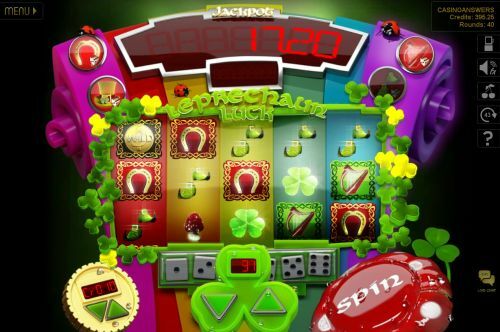 To spin the reels on Leprechaun Luck, select your bet and press the “Spin” button. 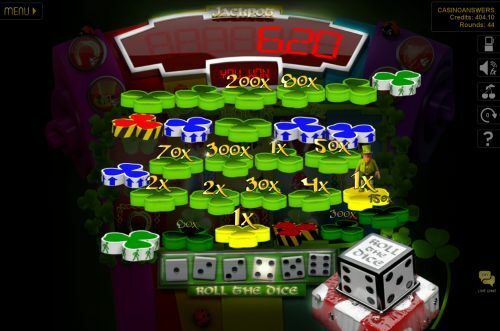 Leprechaun Luck has a progressive jackpot that is currently at $32,579 and getting stronger by the minute. You can win the Leprechaun Luck Progressive Jackpot when you hit 5 Rainbow symbols on a selected payline on a total bet of $5 or more. If your bet is less than $5, you will instead win the 2000 coin top fixed jackpot. Of course, you can also double this winning to 4000 coins using the Double Coin wild multiplier symbol. The Coin symbol is a wild symbol on Leprechaun Luck Slots and will substitute for all other symbols in the game except for the Cauldron symbol. The Double Coin works the same way as the regular Coin wild symbol, except it is a double wild or wild multiplier symbol and will double your winnings. The Cauldron symbol is a scatter symbol on the Leprechaun Luck video slot. It has an interesting way of awarding scatter wins. If at least 3 Cauldron symbols appear on a spin, you will be able to click on one of them to win a scatter prize. Leprechaun Luck has a basic autoplay mode that you can use. Click the arrow symbol near the top right part of the screen to open up the autoplay mode options. You will be able to select 5, 10, 25, 50 or 100 autoplay spins. You can speed up the gameplay by skipping animations on winning combinations. Triggering the scatter feature or the bonus game will bring the autoplay mode to a halt. You can stop the Leprechaun Luck autoplay mode at any time by pressing the autoplay mode button. For those who are interested in Irish folklore about leprechauns and such, you will enjoy the Leprechaun Luck video slot. It’s a nice little 31-line video slot that you can play in your browser with no download required. We can honestly say it’s the best 31-line video slot we have ever played. To try the Leprechaun Luck video slot out, simply sign up and play today over at the USA-friendly Win A Day Casino! Do I need to download any software to play the Leprechaun Luck online slot game? The Leprechaun Luck video slot is only available via flash so you must play this slot in instant play format. You may play the Leprechaun Luck slot game for free or for real money. If you have any problems or issues with Win A Day Flash Casino, make sure you have the latest and greatest edition of Adobe Flash Player installed on your computer. Are players who are based in the United States allowed to play the Leprechaun Luck slot game? Yes, if you are from the USA, you can still play the Leprechaun Luck slot machine at Win A Day Casino. The animations on Leprechaun Luck are a little slot on my computer. How can I speed it up? If your computer isn’t playing the beautiful animations on the Leprechaun Luck slot game properly, we recommend that you right click on the slot game and go to “Quality” and lower the animation quality to either Low or Medium quality.